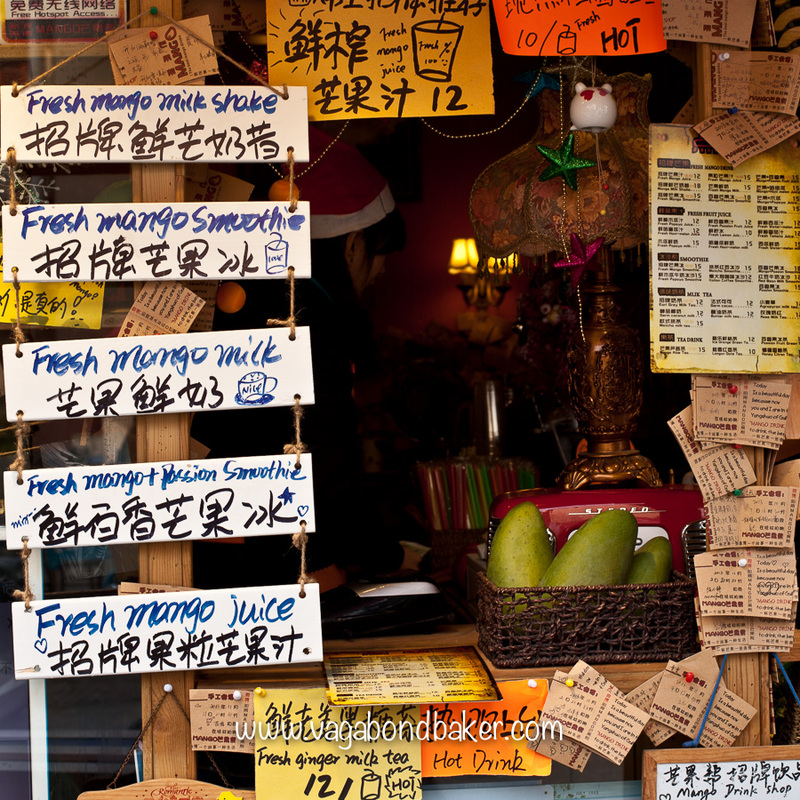 Mango, a fragrant fruit that sends my thoughts away with wanderlust the minute I eat it. The heavenly golden flesh is the stuff of travel dreams: of crazy Asian markets, Thai beaches, heady Buddhist temples and cycle rides between flooded rice paddies, their mirrored surfaces reflecting the bright blue sky. 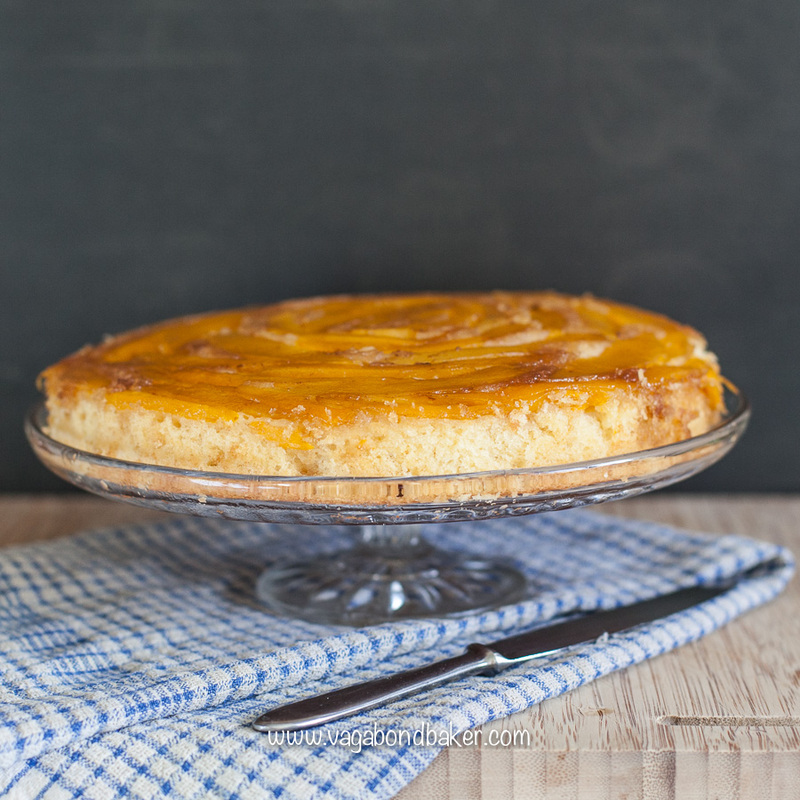 Just the word ‘Mango’ is sun-drenched, add to that coconut and we’re off on a happy, sunny cake adventure! 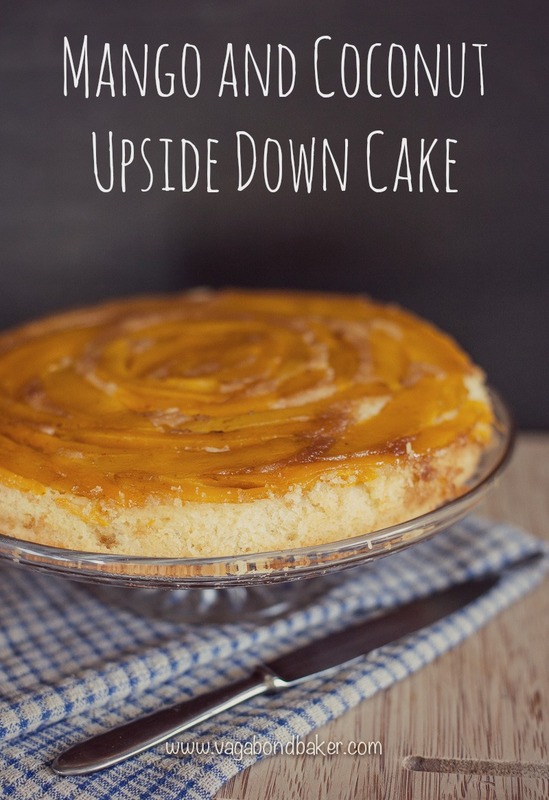 This mango and coconut upside down cake makes an attractive dessert that is delicious served with ice cream or cream; the soft, luscious mango is arranged in a rose and the sponge underneath has a thoroughly pleasing texture from the addition of desiccated coconut. 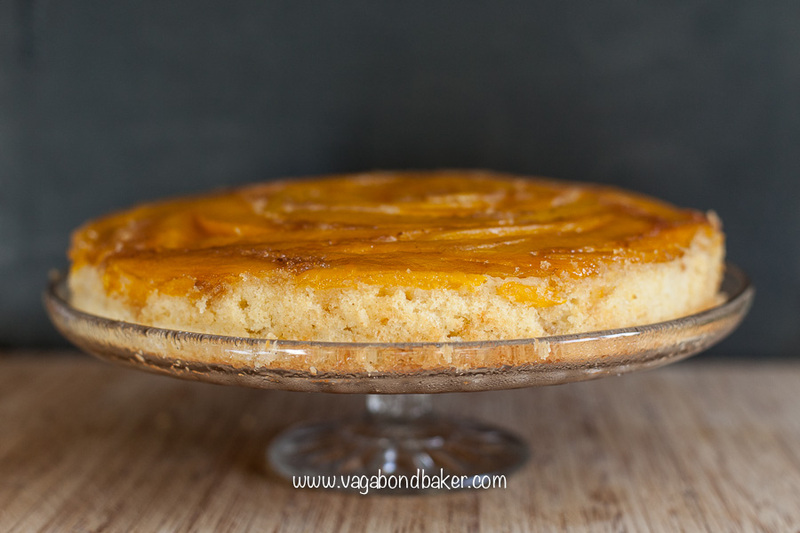 It looks dramatic but it’s actually a quick and simple cake once you have prepared the mango. The cake can be served warm for dessert, or it can be served cold for a delicious afternoon treat with a cup or coffee or tea. 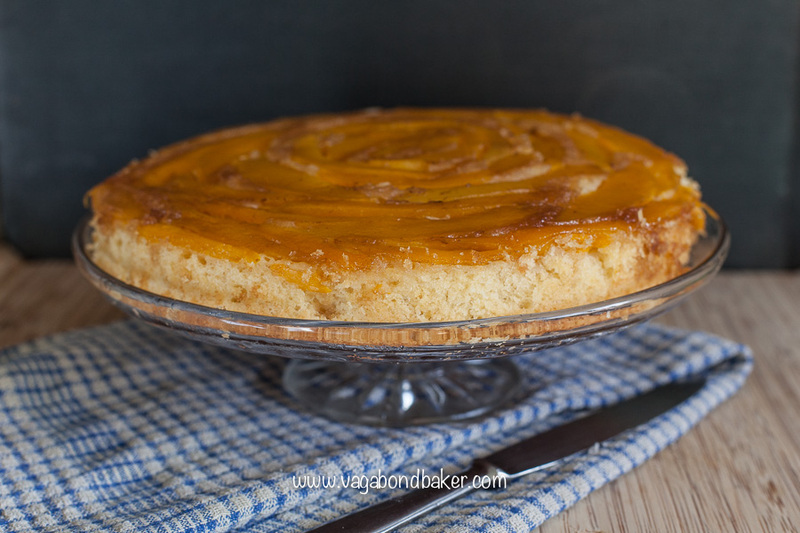 I made this mango and coconut upside down cake with dairy-free sunflower spread (I love Pure brand as it has no nasty artificial additives), rather than butter, and it was still very tasty and light. 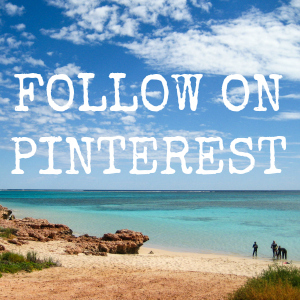 I really hope you enjoy this cake and it leaves you with happy vacation memories! Begin by prepping the mango: slice the ‘cheeks’ off and score fingers of the flesh then slice away each slice from the skin. If the slices are quite thick, slice them into two thinner slices about 4mm thick. Cut away any flesh left around the stone, remove the skin and cut into slim slices. 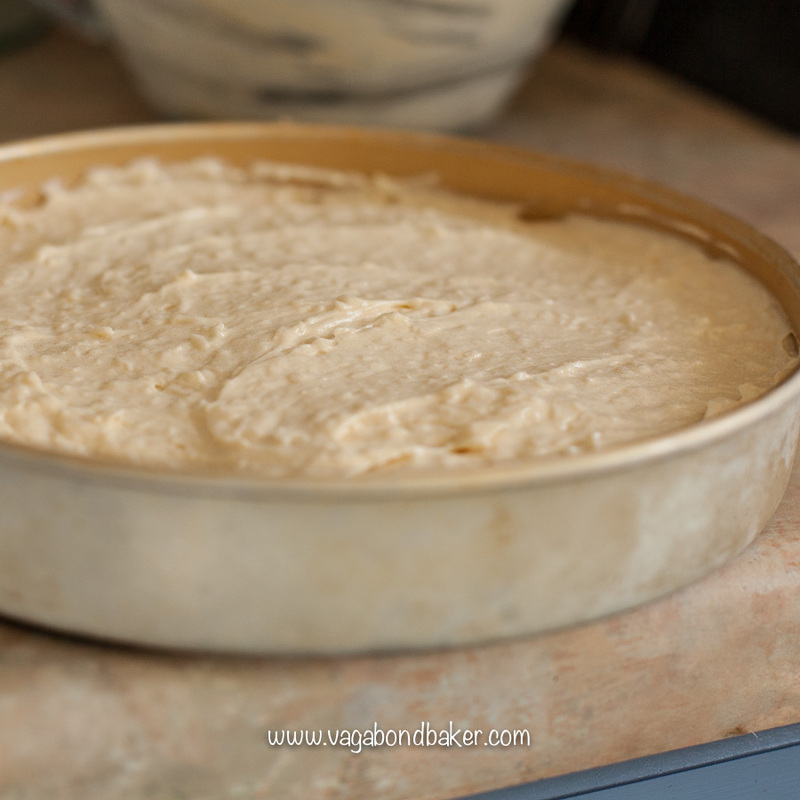 Sprinkle the brown sugar over the base of the greased cake tin. 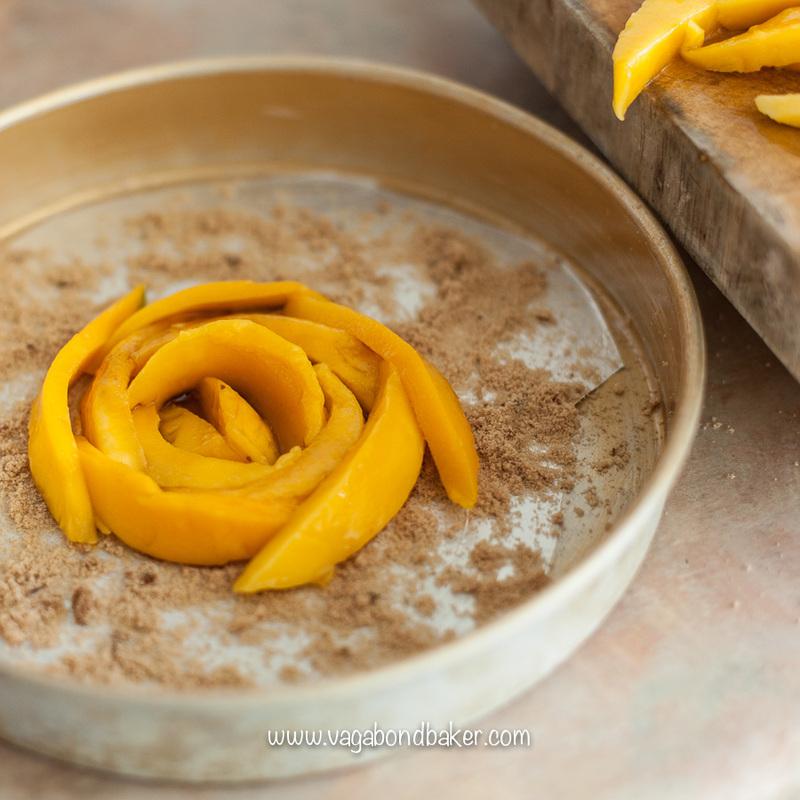 Arrange the mango slices into a rose formation, starting from the centre and working outward. 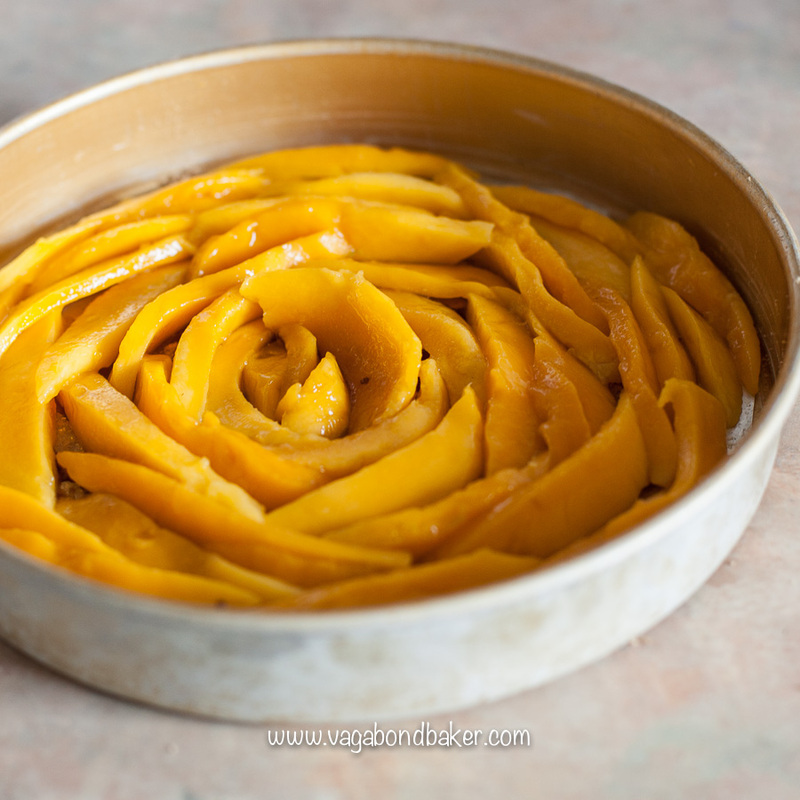 There should be enough slices from two mangoes to cover the base of the tin. Set aside with you prepare the sponge batter. 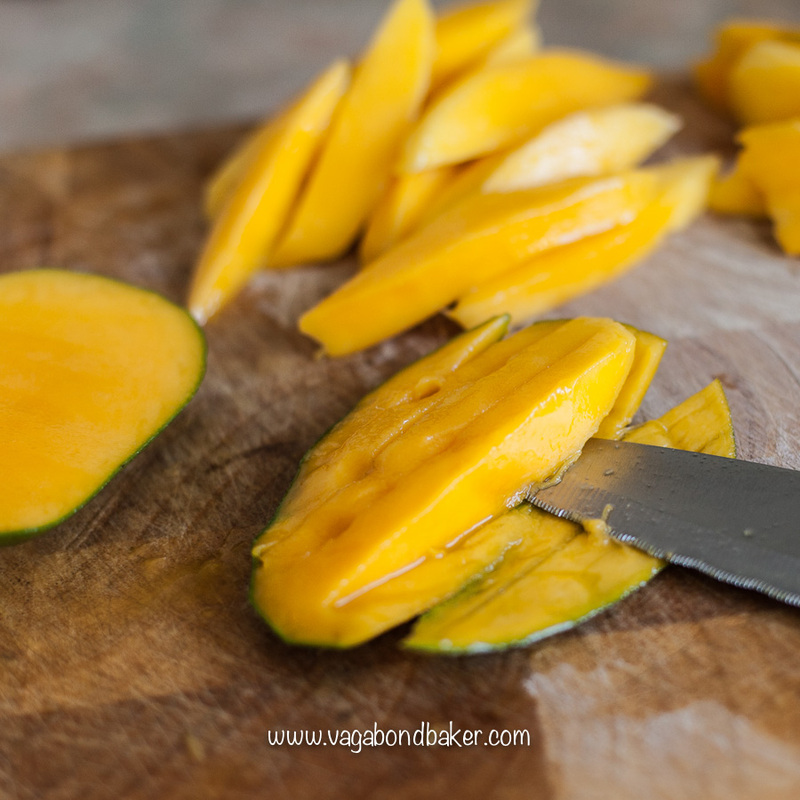 Prepare the mangoes: score into fingers and slice away from the skin. Simply place the caster sugar, the soft unsalted butter, eggs, vanilla extract, flour, desiccated coconut and the milk into a mixing bowl and beat with an electric hand mixer to form a batter. 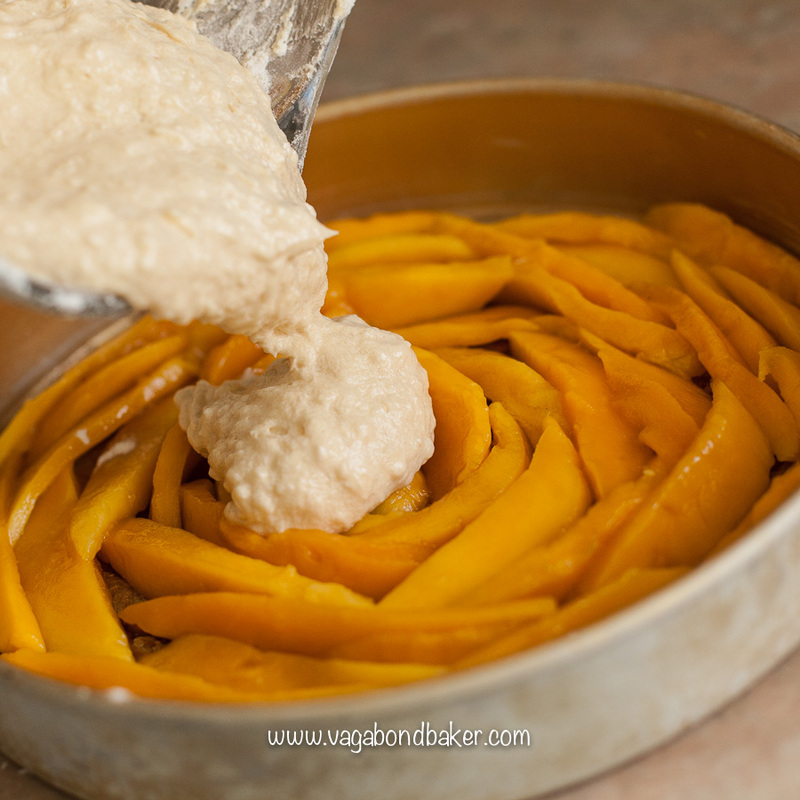 Very carefully, spoon the batter over the mango slices, taking care not to disturb them. Use a spoon to level the surface. Bake in a preheated oven for 22 – 25 minutes until risen and golden, a cake tester should come out clean. Leave to cool in the tin for 5 minutes then run a table knife around the cake to loosen the sides. Take your serving plate and invert the cake carefully onto it. Serve warm or cover the cake and refrigerate if need be. It’s also delicious served cold. 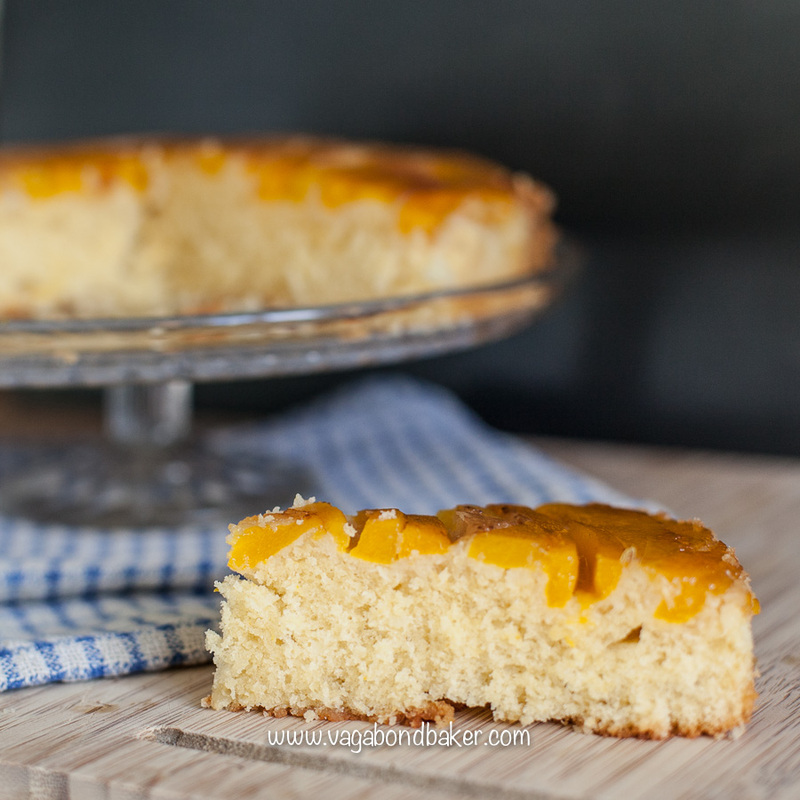 Just the word ‘Mango’ brings a sun drenched image to mind, add to that coconut and we’re off on a happy, sunny cake adventure! Raspberry Coconut Ice a simple retro candy with a twist! Peanut Butter Salted Caramel Squares Yes, they’re as good as they sound! No-Bake Coconut Macaroons Luscious, vegan and gluten free. What memories does mango give you?